Originally the work of a small crew under close direction of then Chrysler President Bob Lutz, and Design Chief Tom Gale, the Viper became iconic even when it was only a concept—one first unveiled at the Detroit auto show in 1989. Today these first Vipers are worth having because they lead a line of now-legendary American supercars; provide the most “bite” with the Viper in its most savage, simple form; and serve to remind us of a time when Chrysler broke out from K-Car convention. The team designing the Viper didn't look to any existing platforms and instead custom-designed a tubular space-frame layout with center spine for the car—complemented by a fully independent suspension with Koni coil-over-shocks, and huge 13-inch brake calipers in front. And a fiberglass body saved weight. The Viper's mammoth 8.0-liter V-10 engine had originally been designed for Dodge Truck duty, but Chrysler looked to Lamborghini for help in designing a new aluminum block and heads, with some of its parts (including the two-valve-per-cylinder pushrod design) carried over. In these first Vipers, the engine was rated at 400 hp and 450 lb-ft of torque, with an impressive redline of 6,000 rpm. The dash to 60 mph came in less than five seconds, and top speed was originally 164 mph. At the time it hit the market, the Dodge Viper provided an amped-up sensory experience typically only found in boutique sports racers of the day, but with a more nuanced, cohesive driving experience—and of course the bodywork of a supercar. Nevertheless, near the limit, early Vipers have a reputation for biting back, with a lack of progressivity in handling at higher speeds and of course, no electronic stability control or even anti-lock brakes. The early Vipers were extremely basic inside, and not all that comfortable. Air conditioning was made available as a dealer-installed option in 1993 and as a factory option in 1994. With no true top (the one offered was essentially a car cover with plastic side windows), no side windows, and no outside door handles, these early Vipers lack even a hint of daily-driver practicality. Driving in hot weather in the original Vipers wasn't exactly enjoyable either, as at low speeds the hot exhaust pipe would heat up the cabin noticeably. And if the driver or passenger weren't careful they could scorch their legs when getting in. Of course, none of that was the point. The car was exceptionally fast and thrilling, an aggressive and bold street weapon. Only 285 Vipers were delivered in 1992 (all red with a gray interior), with more colors and features added in the following years. Production totals were 1,043, 3,083, and 1,577 for '93, '94, and '95, respectively. Dodge Viper ownership is relatively low-cost and trouble-free compared to virtually all other exotic cars, although the engine can be subject to valvetrain issues with wear, or if not broken in properly. Look for any signs of hard use or track use, and check the front valance and side pipes for curb damage or makeshift repairs. For 1995, Chrysler made a true factory (single-piece removable) hardtop available, but most cars from this generation came without a tight-fitting top which usually left the interior vulnerable to the elements, so it is advisable to choose a car that has been stored in a dry, climate-controlled garage. 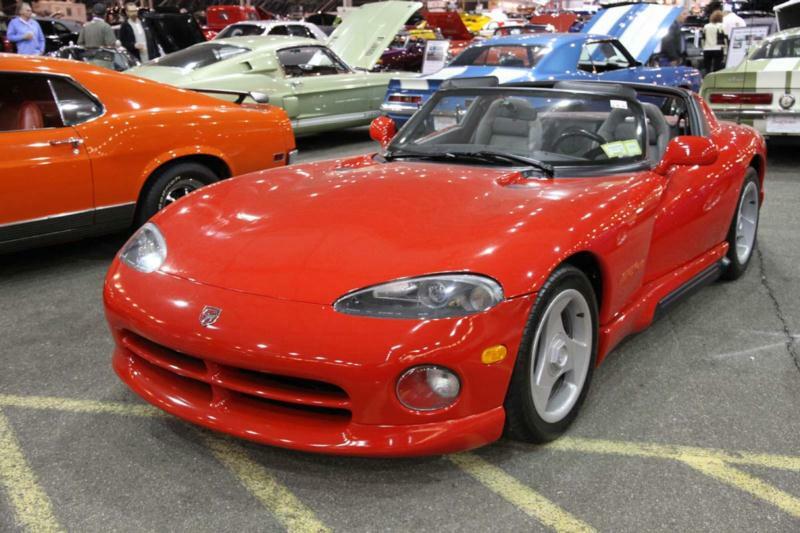 Click here to read Hemmings Motor News' Buyers Guide for the 1992-2002 Dodge Viper.